I had no intentions of posting this recipe anytime soon. Really. As crazy delicious as these cookies are, I thought you would all be cookied out to the max by this time in December. However, after teasing you with these cookies on Instagram, you obviously had other opinions bordering on rebellion if I didn’t share the recipe. At the risk of sounding dramatic, these Twix-like cookies are definitely in my top favorite cookies of all time. I’ve made four batches this week already and am giving them away right and left (and not just to be nice, if they stay in this house, I am in serious, serious trouble). That combination is just too much. A short week ago, these cookies didn’t exist in my reality. They came about when a longtime reader, Laudan (mamalala in the comments), emailed me about her favorite cookie at a little bakery called Stacey Cakes in McCall, Idaho – a beautiful mountainous resort town a few hours from where I live. She had successfully made a pretty similar knockoff and thought I might be interested. Clearly she knows me (am I so transparent?). I felt the timing was somewhat divine considering I had a bowl full of homemade caramel sitting in the refrigerator waiting for the perfect recipe and at risk of just getting eaten out of the bowl when the kids aren’t looking (leftover from making gourmet caramel apples for the kids’ teachers – it’s become a bit of a tradition now). Honestly, these cookies are amazing. 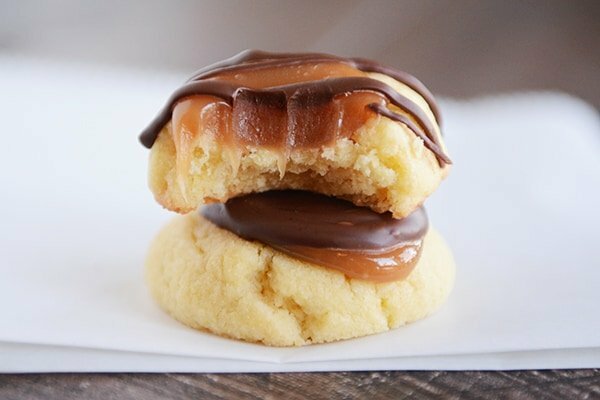 That buttery, tender, melt-in-your-mouth shortbread layer + soft and chewy caramel + chocolate (drizzled or slathered, your choice) is other-worldly. Now that you’ve forced me to post about them, I’m forcing you (nicely) to make them. But remember, the quicker they leave your presence, the better. Consider yourself warned. In a large bowl with an electric handheld mixer (or in the bowl of a stand mixer), mix the butter and sugar until light and creamy, 1-2 minutes. Add the egg yolks and vanilla and mix until combined, scraping the bowl as needed. Add the flour and salt and mix until it comes together. Once it forms pea-size crumbs, I abandon the mixer and get in there with my hands to mush it together into a uniform ball. Shape the soft dough into small balls. I use my #60 small cookie scoop - about 2 teaspoons of dough or .65 ounces for each cookie. 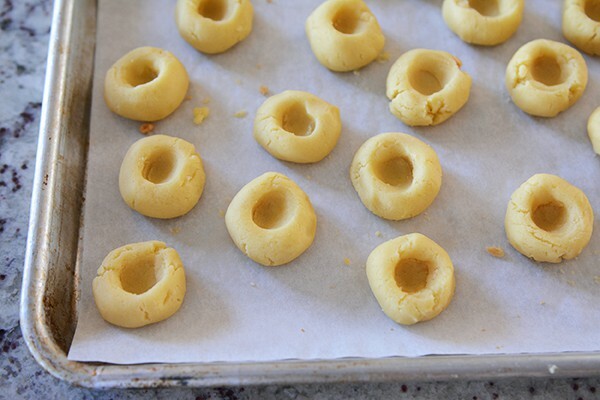 Place the balls close together on a parchment-lined baking sheet. Press a small indentation in each cookie ball - don't make it too wide. I use my thumb and press down - it's ok if the sides crack a bit, just press them together. They'll look like little nests (see the picture below for a visual). Refrigerate for an hour (or longer). Preheat the oven to 375 degrees F. Space the cookies about an inch or so apart on several parchment-lined baking sheets. They'll puff and spread just slightly but not very much. Bake for 10-11 minutes until set and lightly browned on the edges - the longer they bake (without burning, of course) the more like shortbread they'll be in texture (versus being too soft). The centers may puff up while baking, just press them back down lightly after they come out of the oven. Let the cookies cool completely. For the caramel, if using storebought caramels, unwrap and melt the caramels with a tablespoon or so of milk or cream over low heat in the microwave or on the stovetop until creamy and smooth. Homemade caramel can usually be melted over low heat as well without the need for extra cream or milk. Dollop a bit of caramel into the center of each cooled cookie. Let the cookies sit until the caramel cools and sets. Melt the chocolate over low heat in the microwave (or in a double boiler on the stove) and either drizzle chocolate over the cookies or spread a circle of chocolate over each caramel center. Let the chocolate set until hardened (can speed this up by refrigerating the cookies). For the caramels, you'll need about 1 cup of melted caramel (not caramel sauce, it needs to be soft and chewy caramels that have been melted until smooth and creamy). I used homemade - if doing so, you don't need to add the tablespoon or so of cream or milk when melting. If using storebought (like Kraft brand), use that tablespoon of cream or milk when melting the caramels. ﻿UPDATE: several commenters have reported back that Kraft caramels were too firm in these cookies (after melting and using them in the cookie). Others have had good success using Kraft - I think the key is not overheating the caramel when melting. Either way, you may explore other storebought options (Trader Joe's has wonderful soft caramels that may work). I’ve been saving this recipe for a few months because I was so excited and wanted homemade caramel. Now I’m trying to figure out what went wrong. I followed the recipe carefully. The dough was way too wet. The cookies melted and cooked flat. Super disappointed. The homemade caramel was delicious though. OMG. These cookies are ridiculously delicious. Seriously. Stop what you are doing right now and make them. I used the Werther’s Original Chewy caramels (both the regular chewy and the soft chewy ones) and the caramel melted easily and was perfect for the cookie. I had a little trouble drizzling the chocolate with my first batch of these. But, if at first you fail, try, try again! With my second batch I put the melted chocolate in a pastry bag with a Wilton #5 small hole tip and the results were beautiful. Yum. Have you make these ahead of time and frozen them fully assembled? Has anyone tried this with dulche de leche? Is that too much like caramel sauce? The first time I made these I made the homemade caramel that’s linked (newbie in the homemade caramel department) and I must have cooked it on too high of heat because they were very hard in these cookies. I made them again today with the same homemade caramel that’s linked and success! They’re delicious! Thanks for a great recipe that’s easy to follow and including pictures! I love it! Just made it yesterday and really love it. Thanks for all great recipes! Pure awesomeness! Easily in my top 5 of favorite cookies. I used Kraft caramels but was *very* careful to heat them and the cream just to the point at which they were softened and then let stirring and the residual heat finish the melting – nicely soft. I may have added an extra teaspoon or so of cream. Everyone needs these cookies. Now. Seriously. They are amazing! These were a hit at the cookie swap – but some spread while cooking. Any suggestions on what I did wrong? Also, any hints on the best way to drizzle chocolate? These cookies are the bomb! I’m a long-time fan & feel like we’re friends since I visit your site so often. Thank you for all the great recipes! You’ve been a life-saver, especially since my husband was diagnosed with celiac disease; it’s great to find meal solutions that keep him healthy and the family happy. Also love your IP recipes! Do you need a specific type of chocolate for the drizzle? Bar? Chips? I usually melt bar chocolate because it drizzles better, but Ghirardelli or Guittard chips usually melt pretty well, too. These taste fabulous! I made a double batch so I could give some away. The first batch I made as cookies. The second batch I decided not to putz around with making individual cookies so I saved myself some time and pressed the dough into a 9×13 pan. baked them for 15 minutes. I also cut them into squares right out of the oven while they were soft because once cooled they harden quite a bit. Holly, did you just pour the caramel over it all then? Did it run off the bars once you cut them? Thanks in advance. I wanted to do this too, but wasn’t sure how it would turn out. Glad to see your comment that you did it. These are some of our favorites! I wanted to make these for a family vaca. Would they be okay made ahead of time if I put them in the freezer? I haven’t ever frozen them, but I do think they would work well made in advance – how far in advance do you need to make them? Any suggestions for getting the caramel into the cookie easily? Thank you! The cookies are in the oven and I will put the caramel and chocolate on tomorrow. Your homemade caramel sauce was so easy and amazing! I just kind of spoon it in, Jodi…seems to work great! I made these for a holiday potluck at work and they were a hit! I was short on time, so I used a package of Kraft caramels. I used approx. 2 tbsp of milk to thin, and removed them from the stove when they began to melt. After a few minutes of constant stirring, I was good to go. Based on that, the Kraft caramel version worked perfectly for me. These cookies were a breeze to make, even though they look way more involved. Thanks for a great recipe! I can’t believe I missed this recipe!! I have looked for a carmellita recipe for years that doesn’t use oatmeal. I first had these cookies when I worked st Gloria Jean’s coffee shop eons ago. My all time favorite. Thank you!! I just made your hot fudge sauce as a trial run for Christmas giving. It’s very good! Do you think I could warm some of that up for the chocolate drizzle? I haven’t ever tried it, but it’s Certainly worth a try! I am planning on doubling this for a cookie exchange, should I double the homemade caramel or is there usually quite a bit of caramel leftover? Plenty of homemade caramel for a double batch! These are amaze-balls! Just brought them to a Super Bowl party and they were loved by all. I sliced off some of a caramel loaf I had ordered and added just a little milk and melted it in the microwave and the texture of the caramel was perfect. This one is getting printed; I’m sure I will be making it many times. Oh, and I used the end of my rolling pin to make consistent indents in the cookie balls based on a tip from my sister-in-law. 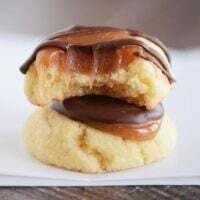 Mel, would your dulce de Leche recipe work for the caramel portion of the twixters? 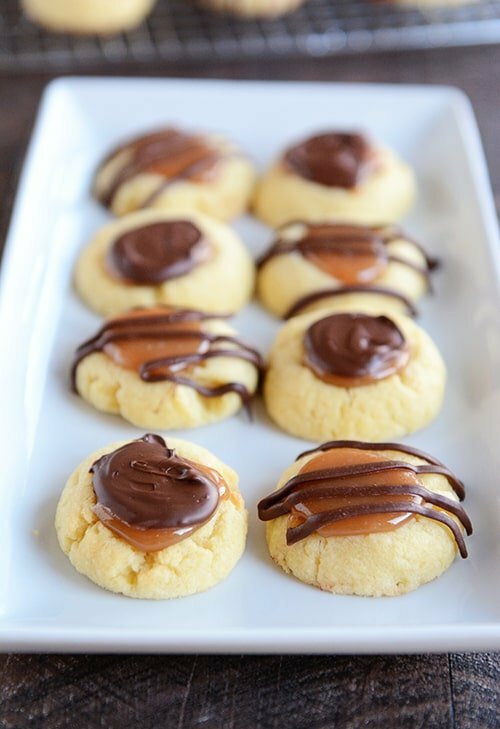 I think it definitely could – it would give an entirely different flavor and texture to the cookies but since I love dulce de leche, I think it would be delicious! These cookies! I made them for Christmas cookie platters but honestly they didnt exactly make it that far. They were far & away everyone’s favorite! They are definitely a keeper! Next year I’m gonna hafta hide them so I can shamelessly eat them all without having to share…uh…I mean…so I can put them in cookie trays. Thanks so much for sharing! Just finished making these, and while they were a bit time consuming, they were delicious! I just did steps between doing other things for New Year’s Eve party tonight. I’m doing these, Southwest egg rolls, savory spiral rolls, bacon jalapeño cheeseball (all your recipes, of course), mini cheesecakes, stuffed mushrooms, and a shrimp/sour cream dip. who’s the crazy lady who thought all this food would be a good idea!!? I’m exhausted!! Oh my gosh, you and me both! I’ve been in the kitchen more today than I was on Thanksgiving or Christmas! These cookies are the best !!!! I’ve made three batches in two days and I will be making another batch before the weekend is over. I used your home made caramel candy recipe and it turned out perfect ! I had already made a list of the baking I would be doing for Christmas. And then I saw this recipe (and mouthwatering picture!) on your website. I knew that I had to add these cookies to my list. They were EXCELLENT and I received many compliments on them. Thanks for another great recipe! I just made these and they are so delicious! Thank you so much! My neighbors thank you as well. I used Werther’s soft caramels and they turned out perfect. I used homemade caramel sauce that I had in A jar in my fridge from earlier this month. Took these to a cookie exchange today – they were a hit (based on their appearance). As someo of the others have noted, next time I make them I will try a different brand other than Kraft, to see if I can get the centers a little softer. Thanks Mel for a fun recipe! Mel ~ Was thinking to make these for Christmas…how long do they stay fresh and can you freeze them? I’ve never frozen them. Well-covered they stay pretty good for 2 days (the shortbread tends to soften over time). I agree with laura I made these also and the caramels were way too hard if you use Kraft. Buy soft ones. The cookies do not work well with Kraft. The cookie base itself is wonderful. Thanks for checking back in with this info, Julia! I know others have used Kraft caramels with good success but I’ll still add a note to the recipe. I know with any kind of storebought caramel – overheating it will cause it to be much firmer. But with that being said, the cookies still tasted fantastic! Thanks for another great recipe, Mel! My word, these are all my favourite things rolled into one by the sounds of it! These cookies look amazing! I would love to get these from a cookie exchange! is there a recipe for the home made caramel? Yes, there is a link in the little note right before the list of ingredients! I have probably made 40 dozen cookies this Christmas to ship to my children, parties and get-togethers. I thought that I was done until I saw this recipe. I made it today, these cookies are fantastic! Yahoo!- the cookies made the cut. I need to make these again. Love your pictures. I made these last night after seeing this post. They are so yummy! I use store bought caramels and am sure they would be even tastier with homemade. I love your blog…thanks for sharing!! These look just like the “Carmelitas” that Starbucks used to sell – and sadly discontinued. They were DELICIOUS! I cannot wait to make these. Thanks for posting the recipe! A couple of years ago I was making your ruby jewel cookies and didn’t have enough jam–but I did have some homemade caramel on hand. So it made a similar cookie to this (with a chocolate drizzle of course)! They were the FAVORITE cookie at the cookie exchange party. 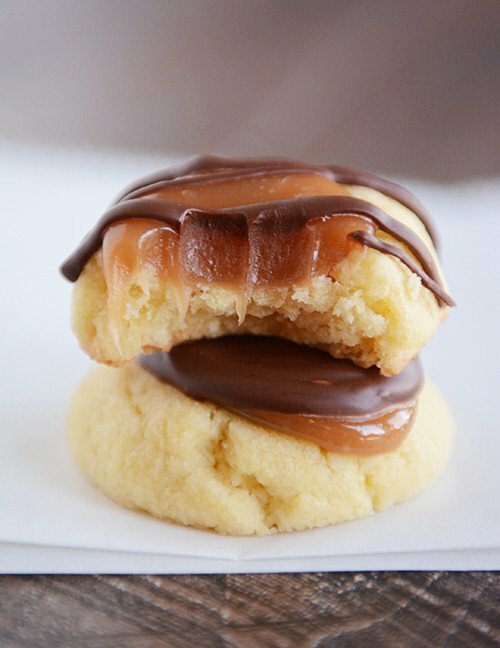 The buttery shortbread, caramel, and chocolate combo are dangerously delish! A couple of years ago I made your ruby jewel cookies and ran out of jam. But I had leftover homemade caramel on hand, so I made a similar cookie to this (with a chocolate drizzle of course!) and they were the FAVORITE cookie at my cookie exchange. 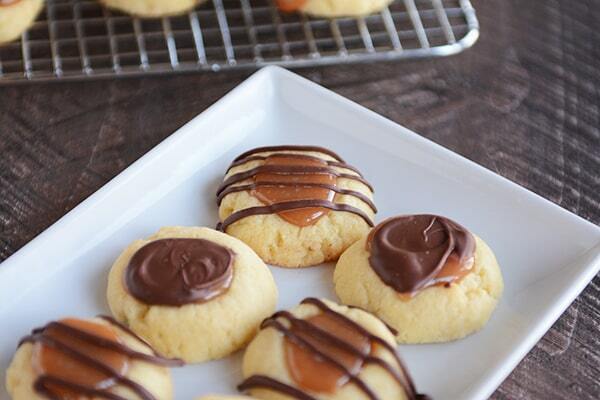 The combo of buttery shortbread, caramel and chocolate are dangerously delish indeed! I put these into mini muffins and pressed the center to form a cup and they turned out very nice. I made 48 cookies this way. I have had the recipe critics recipe on my list for awhile but still haven’t gotten around to them. I see that the ratios are different for the shortbread cookies…which one would produce a softer chewier cookie? Not sure as I’ve only made this version. You could try baking them for less time for a softer cookie but they probably won’t be chewy just based on the ingredients (both recipes). y bst trick for thumbprints of any kind…make the divot with a CORK! Yay! I’m so glad you posted this recipe! These are joining my big batch of cookies for the neighbors this weekend. They look like they would go really well with morning coffee, too. I love a good twix… this could be very dangerous indeed. Just perfect! Everything to love in a cookie. Gotta make! You are crumbling my resolve to not overindulge or overfill my days with extra tasks during this holiday season. I, too, am now in serious trouble. Thank you Mel readers for the rebellion. Gotta fit these in somewhere even if it’s the midnight shift. And thank you Laudan for spurring Mel on with wonderful ideas.